July 4th is considered the largest secular holiday in the United States and the unofficial mid-point of summer. But did you know some of our founding fathers wanted the celebration to be commemorated on July 2? Enjoy these fun facts as you celebrate our nation’s independence. Why the 4th and Not the 2nd? The Revolutionary War began in April 1775 as colonists started efforts to break away from Great Britain rule. By June 1776 the move toward independence was in full swing. On June 7, 1776, the Continental Congress met in Philadelphia to discuss a motion calling for independence for the colonies. The motion was debated but a vote was delayed. Instead, five men were appointed to draft a formal resolution justifying the separation from England. Those five were Thomas Jefferson of Virginia; Roger Sherman of Connecticut; John Adams of Massachusetts; Robert Livingston of New York, and Benjamin Franklin of Pennsylvania. The five-man committee spent the next few weeks drafting the formal statement, which was largely written by Jefferson. On July 2, the Continental Congress met again and voted in favor of the June 7 resolution to separate from England. On July 4, the Declaration of Independence was formally adopted by the Continental Congress, and that date was chosen to celebrate the colonies’ independence. History books say that on July 2 after the vote John Adams wrote to his wife, Abigail, that July 2 “will be celebrated, by succeeding generations, as the great anniversary festival.” When July 2 was not chosen as the official day of independence, Adams reportedly refused invitations over the years to attend July 4th celebrations. Ironically, he and Thomas Jefferson both died on July 4, 1826, the 50th anniversary of the Declaration of Independence. Will You Be Grillin’ and Chillin’? Americans love their barbecues and more people fire up the grill on July 4 than on any other day (about 74 million people, in fact). 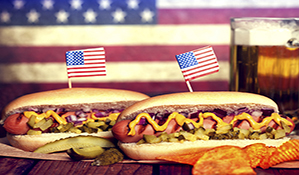 150 million pounds of hot dogs will be eaten over the holiday weekend. 750 million pounds of chicken will be bought in the week before the Fourth. 190 million pounds of beef and pork will be bought in the two weeks prior to the holiday. Condiments are king. We’ll spend $203 million on condiments alone for July 4, and $92 million on chips and about $60 million on dip. Beer sales over the holiday weekend alone account for 5 percent of annual beer sales, with just over 68 million cases sold for July 4. And don’t forget the potato and macaroni salads, coleslaw, deviled eggs, baked beans, corn, watermelon, and desserts! Americans will spend close to $600 million on fireworks. Unfortunately, there will be about 1,400 hand injuries; 1,000 head injuries; and 900 foot injuries from fireworks this holiday. The four most dangerous fireworks are bottle rockets, sparklers, cherry bombs, and homemade or illegal fireworks. Want to watch the fireworks? There will be about 14,000 displays (not including backyards) across the country. New York City has the largest display in the country and uses about 75,000 lbs. of fireworks in the 26-minute show. Sadly, July 4 is the deadliest day on U.S. highways, beating out New Year’s. A whopping 41 percent of fatalities that day are alcohol-related, compared to 31 percent on an average day. Close to 500 people will lose their lives on the road July 4. Remember, don’t drink and drive. If you know you’ll be drinking, assign a designated driver ahead of time. As you enjoy family and get-togethers over the holiday weekend, remember the service and sacrifice of the brave men and women who have fought for centuries to ensure our freedom. Thank a veteran today.